Q1. Which of the statements about the reaction below are incorrect? Q3. What happens when dilute hydrochloric acid is added to iron fillings? Tick the correct answer. Ans: (a) Hydrogen gas and iron chloride are produced. Q4. What is a balanced chemical equation? Why should chemical equations be balanced? Ans: The total mass of the elements present in the products of a chemical reaction has to be equal to the total mass of the elements present in the reactants. Such a chemical equation is called balanced chemical equation. A chemical equation is balanced to satisfy the law of conservation of mass. Q5. Translate the following statements into chemical equations and then balance them. Q6. Balance the following chemical equations. Q7. Write the balanced chemical equations for the following reactions. Q8. Write the balanced chemical equation for the following and identify the type of reaction in each case. Type of Reaction is double displacement. Type of Reaction is decomposition reaction. Type of Reaction is combination reaction. Q9. What does one mean by exothermic and endothermic reactions? Give examples. Exothermic Reaction: Reactions in which heat is released along with the formation of products are called exothermic chemical reactions. Endothermic Reaction: Reactions in which energy is absorbed are known as endothermic reactions. Q10. Why is respiration considered an exothermic reaction? Explain. Ans: Our body requires energy to support life. Our body obtains energy from food that we eat. During digestion, body mechanisms breaks down complex energy molecules of food into simpler substances such as glucose. This glucose is used with oxygen during the cellular respiration and gives energy. The releasing of energy carries on during the whole process. That is why the respiration is considered as an exothermic reaction. Q11. Why are decomposition reactions called the opposite of combination reactions? Write equations for these reactions. Ans: In decomposition reactions a compound breaks down to form two or more substances. These reactions require a source of energy to proceed. Thus, they are the exact opposite of combination reactions. In the combination reaction, two or more substances combine to give a new substance with the releasing of energy. Q12. 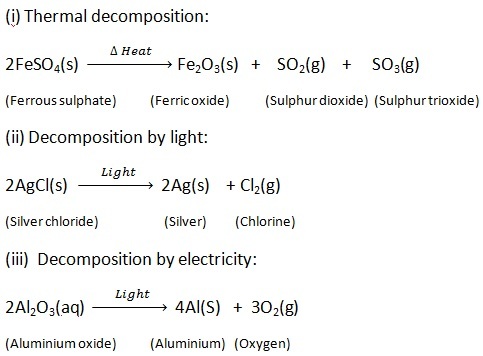 Write one equation each for decomposition reactions where energy is supplied in the form of heat, light or electricity. Q13. What is the difference between displacement and double displacement reactions? Write equations for these reactions. In a displacement reaction a more reactive element replace a less reactive element from its compound. Here, A is more reactive element and B is less reactive element. In double displacement reaction, the exchanging of ions are taken place. Q14. In the refining of silver, the recovery of silver from silver nitrate solution involved displacement by copper metal. Write down the reaction involved. Q15. What do you mean by a precipitation reaction? Explain by giving examples. Ans: A reaction in which precipitate (an insoluble substance) is formed is called a precipitation reaction. The white precipitate of BaSO4 is formed by this reaction. Q16. Explain the following in terms of gain or loss of oxygen with two examples each. (a) Oxidation: if a substance gains oxygen or loses hydrogen during a reaction, it is oxidised.�€‹ Such reaction is known as oxidation. Here copper gains oxygen and gets oxidised. (a) Oxidation: if a substance gains oxygen or loses hydrogen during a reaction, it is oxidised.�€‹ Such reaction is known as oxidation. Example1: Copper gains oxygen and gets oxidised. Example2: Hydrogen gains oxygen and gets oxidised. (b) Reduction: If a substance loses oxygen or gains hydrogen during a reaction, it is reduced.�€‹ Such reaction is called reduction. Here Copper loses oxygen and gets reduced. Example2: Here zinc loses oxygen and it gets reduced. Q17. A shiny brown coloured element ‘X’ on heating in air becomes black in colour. Ans: X is copper and black coloured compound is copper oxide. Q18. Why do we apply paint on iron articles? Ans: We apply paint on iron articles to prevent corrosion. Paints or oil keeps away iron surfaces by contacting with air or air moisture. Q19. Oil and fat containing food items are flushed with nitrogen. Why? Ans: Nitrogen is an anti-oxydising agent (antioxidant). It reduces the possibility of getting oxidised of food items. So Oil and fat containing food items are flushed with nitrogen. Q20. Explain the following terms with one example each. (a) Corrosion: When a metal is attacked by substances around it such as moisture, acids, etc., it is said to corrode and this process is called corrosion.�€‹ Corrosion is a process of a term corrode in which metal loses in metal surface. Example: Rusting of iron surfaces and loses of copper's rod surface when it comes in contact of air and forms black compound copper oxide. (b) Rancidity: When fats and oils are oxidised, they become rancid and their smell and taste change.�€‹ The process of oxidising such a food material is known as Rancidity. Example : Any oily food items which are left for a long time they get rancid.